(hla) THE human body is made up of 70% water. Water is what keeps our blood flowing, helping to deliver nutrients to all cells and remove waste. We may survive for some time without food but not without water. Plenty of water is lost through respiration and perspiration during exercise. According to Carlson, the director of Performance Nutrition for Athletes' Performance, which trains many of the world top athletes, just by losing 2% of your body weight in fluid can decrease performance by up to 25%. Therefore, drinking water is essential if you want to get the most out of your workout. Nonetheless, how much water is ideally drunk during workout? How much water is ideal in keeping the body hydrated? While many people are told that drinking lots of water is very important, only a handful know that drinking too much can lead to water intoxication. Water intoxication is a result of drinking too much water in a short time, causing hyponatremia when the level of sodium (i.e. salt) in your blood to drop too low. Records from the US National Library of Medicine have shown that water intoxication can be fatal. A 64-year-old woman, after compulsively drinking water in vast quantities (between 30 to 40 glasses), had experienced episodes of vomiting, appeared to be hysterical and distressed, and died some time later after she fell asleep. Early detection of hyponatraemia is crucial to prevent death. When the blood becomes excessively diluted from too much water and the sodium level in the body drops to a dangerously low level, one may experience nausea, headache, confusion, fatigue and in extreme cases, coma and death. Hence, it is very important for one to maintain an ideal level of water intake during a workout to prevent hyponatraemia. 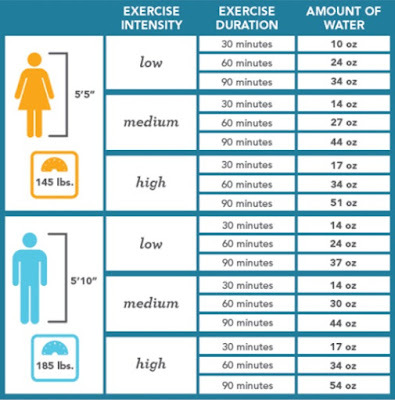 According to Greatist and CamelBak, the recommended level of water intake is as shown on the chart. 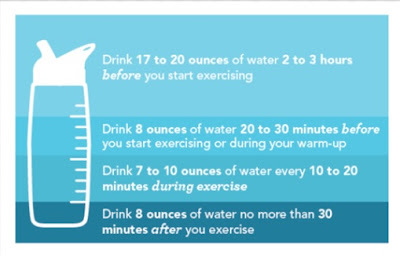 Drink 17 to 20 ounces (502-591 milllilitres) of water 2 to 3 hours before you start exercising. Drink 8 ounces (236 millilitres) of water 20 to 30 minutes before you start exercising or during your warm-up. 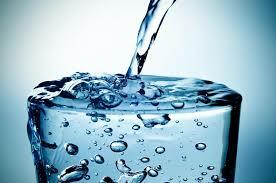 Drink 7 to 10 ounces (207-295 millilitres) of water every 10 to 20 minutes during exercise. Drink 8 ounces (236 millilitres) of water no more than 30 minutes after you exercise. The ideal level of water intake also depends on other factors, such as the intensity and duration of the exercise. The following chart is the CamelBak's Hydration Calculator, which serves as a reference for an ideal water intake during workout depending on the exercise intensity and exercise duration. 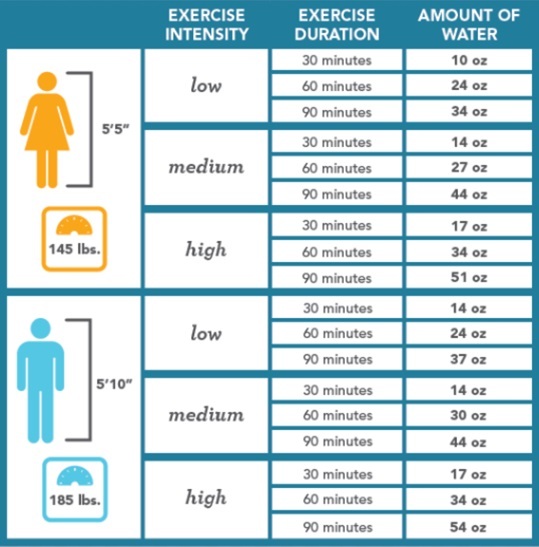 From the observation of the chart, we can conclude that the higher the exercise intensity and the longer the duration of the exercise, the higher the amount of water intake is needed. Exercise leads to water loss through respiration and perspiration. Heavy exertion and sweating can cause dehydration and therefore lead to the loss of electrolytes in the body. Electrolytes are substances such as salts that contain ions, which help receive and send messages throughout the body. It is therefore vital to maintain a healthy level of electrolytes in the body. Some of the ways to replenish the body with electrolytes after losing them include drinking sports drink that will help you replace lost electrolytes. Another simple and cost-effective method to ensure that the electrolytes are maintained and no water intoxication occurs in case one over-drinks during a workout is to add one teaspoon of salt to 2 litres of water. It is important not to mistake salt as the normal, cheap white table salt that we find on the shelves in the supermarket. Such salt has been heavily processed and will take away all the nutrients that the body needs. This table salt will make you more thirsty instead. The best salt to add in the water for hydration is sea salt, which contains more than 84 minerals and nutrients that our body can assimilate. This mineral content holds more of the water within the body and therefore, will help satisfy the thirst. Not only must we know how much to drink but it is also essential to learn how to drink it. Only when we are drinking right, we will get the most out of a workout session.